This video to BlackBerry guide shows you how to convert video files to BlackBerry, download YouTube videos to BlackBerry Tour 9630, convert YouTube video to BlackBerry Storm, BlackBerry Tour 9630 using Clone2Go Video to BlackBerry Converter. 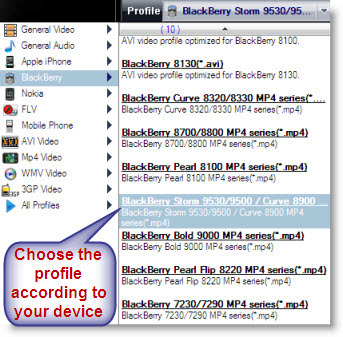 download YouTube/Google videos for BlackBerry Storm/Pearl/Curve/Bold/Tour. Note: You can also convert your DVD collections to BlackBerry video format for viewing on your BlackBerry using Clone2GO DVD to BlackBerry Converter. Here is the tutorial link: How to convert DVD movies to BlackBerry Storm/Tour 9630?. Now let's take a look at how it performs to convert video to BlackBerry and download and convert YouTube videos to BlackBerry using Clone2Go Video to BlackBerry Converter. Step 1. Download the latest version of Clone2Go Video to BlackBerry Converter ( free download ). Install and run it. Step 2. Click the "Add Video" button to import video files. Alternatively, you can click "File -> Add Video Files..." to load the videos that you want to watch on your BlackBerry. After the videos are imported, there will be a list of video file items showing in the program. Step 3. From the "Profile" drop-down list, navigate to the "BlackBerry" category and choose the most appropriate output format according to your BlackBerry device (BlackBerry Storm 9530, 9500, BlackBerry Bold 9000, BlackBerry 8800, 8830, 8820, BlackBerry Pearl 8100, BlackBerry Curve 8300, BlackBerry Tour 9630). To know more about how to download YouTube videos for your BlackBerry, please head to: How to free download YouTube videos for BlackBerry Storm/Tour 9630? Step 5. Click the "Start Encode" button to start to convert video files for your BlackBerry. Note: The output files are easily available by clicking the "Folder" botton in the main interface after the encoding process. Sometimes, we don't need the whole video file for viewing on BlackBerry. In this case, you can use the "Trim" function to get the exact clip from the video. There are two methods to trim the video using Clone2Go Video to BlackBerry Converter. Click here to learn more. You can also customize a specific profile to meet your needs. Click here to learn more.